Qin Xiang watches Hua Yue Nong’s practice and says that while it’s good, it’s not perfect. From her indications, her brother starts playing the music and the girl playing the Princess in Hua Yue Nong play starts playing better. As Ding Ling dances, she meets Qin Xiang’s eldest brother’s eyes and they share a moment. Xin Yue admits that the music elevated the dance, even if she doesn’t trust Qin Xiang. Hong Gu defends Xin Yue because Xin Yue is almost always right about people. Xin Yu smiles and gives each of the 3 Qin siblings a summary. Elder Brother Qin is a upstanding gentleman whose behavior is correct, polite and courteous. Second brother Qin is a selfish, proud scoundrel. And Qin Xiang, she wears white and covers her face – meaning that she doesn’t try to use her beauty to control others. But beneath that cover of innocences lies someone who is willing to do anything, sacrifice anyone for her goal. When Elder Brother Qin and Qin Xiang are alone he suggests that they leave, because Xin Yue uses every opportunity to shame her and them. Qin Xiang says no, the one who wrote Hua Yue Nong is someone who is ambitious, and the person they’re looking for. She assures her brother that in no less than 10 days, Xin Yue’s interest will align with theirs. During one of the performances of Hua Yue Nong, a man walks in, and Hong Gu is bowing him in. His face is emotionless as he asks for the Landlady. Hong Gu assures him that the landlady is coming. Xin Yue walks in and smiles to herself, Wei Wu Ji turns to look at her. She walks to his side, he asks if she’s finally stop playing with wolves. They smile at each other and he asks why she didn’t come find him, now that she knows who he is. Xin Yue asks him how his spice trade was going. The others looked at them confusedly as he replies, “So you missed me.” They’re interrupted by a girl, who tells Xin Yu taht Wu Ye had come with a very handsome man who speaks softly. Xin Yu smiled and nearly runs away from Wei Wu Ji before bowing respectfully and arranging his viewing box for him. She sees Jiu Ye and asks happily why he didn’t tell her, he tells her that he was curious about the play, since she’s been working so hard that she hasn’t had time to come home. She tells his servants to go up the stairs, and Jiu Ye tells them to go ahead. She had built a small elevator for him to pull him up, and in that small cramped space she smells a fragerance, she bends low to keep sniffing only to be sniffing Jiu Ye. She realized that its the dried sweet smell of herbs and medicine. She looks up into Jiu Ye’s eyes and stands back up hastily. She leaves Jiu Ye and meets back up with Hong Gu, who tells her that Wei Wu Ji’s face is super cold, like winter, and she’s only wearing her spring clothes. They meet a landlady competitor who had stolen their most popular girl. 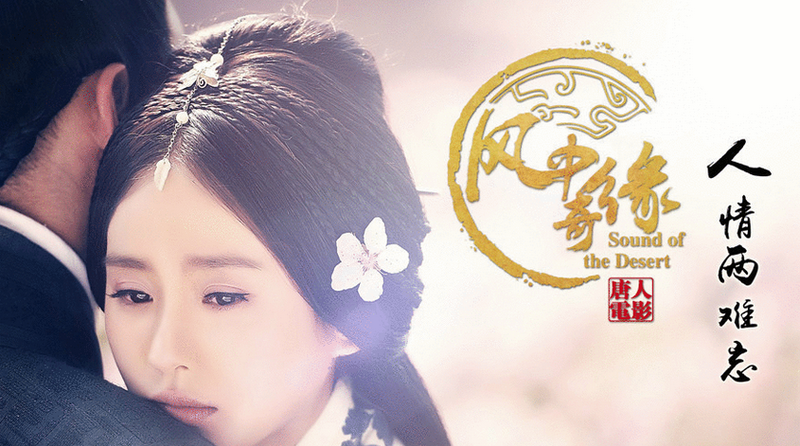 Hong Gu gets the upperhand, and leaves Xin Yue to take care of Wei Wu Ji by herself. Wei Wu Ji and Xin Yue talk, he asks her if she could forgive him for lying about his true background, he didn’t have time to tell her about his identity. She asks if he was still suspicious of her, telling him that she’s just a girl of the desert. He tells her that he believes her, and one day he will hold her hand and she’ll tell him the things that she’s not telling him now.He asks again why she didn’t come find him. Xin Yue replies that when she needed, to she didn’t know where he was. And then she didn’t need him, she didn’t really care to see see him. 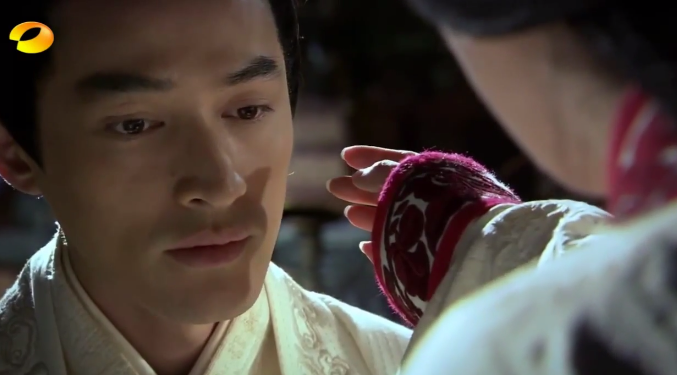 He asks her what her goal is for putting on Hua Yue Nong, does she want to get noticed and become a royal concubine? She says no, she’s not insane enough to enter the palace. But she wants to get noticed – by the real princess. Word gets to XIn Yue that Jiu Ye is mad about Hua Yue Nong and has Wu Ye kneeling to explain himself. She tells Wei Wu Ji goodbye, he smiles and says that if the Shi Enterprises do not want her, his household does. Jiu Ye coldy tells Xin Yue that she’s too smart just for one dance house. This play was done with the upmost care to attract the right attention and to leave the viewer praising the main characters of the play. It’s obviously about the current Princess and her Husband. Wu Ye will be punished accordingly. Wu Ye cries sadly not for himself but for the recent state of Shi Enterprises, which is no longer powerful and has been declining. Jiu Ye ask why Xin Yu wants to bother the royal family. She replies that the Shi Enterprises didn’t become weaker because of him, but rather because Jiu Ye’s family is no longer in the royal favor. He sighs and says that he has to take care of the tens of thousands who depend on the Shi Enterprises and can not take that risk. He’s decided to sell the dance house. With that he leaves. The competiting Dance house landlady comes back with chests of silver, haughtily crying that she want to buy Xin Yue’s dance house. She even starts dismantling the dance house, Xin Yue orders her to stop. The dance house might be for sale, but it’s because Xin Yue is buying it. While she doesn’t have enough money, with the dance house girls’, Hong Gu’s, her’s and Hua Yue Nong’s fees, it would be enough. The other landlady leaves in a huff. Hua Yue Nong might be a dangerous play to put on (it’s the story of the current princess and her husband – a lowly horse boy turned great general) but Xin Yue decides to continue putting it on. It’s later revealed when the competing Dance House lady “accidentally” meets with Qin Xiang, that Qin Xiang was the mastermind. Qin Xiang was the one who had told the Dance House lady about XIn Yu’s dance house selling to force Xin Yue to buy it for herself and keep Hua Yue Nong as the main attraction, and Qin Xiang had manipulated it so that Hong Gu would take her and her brothers in. Qin Xiang admits to it, saying that she has only one goal and she doesn’t care if anyone gets in her way. When the Competing Dance House Landlady tries to attack Qin Xiang, Xin Yue steps in. Xin Yue surmises that Qin Xiang wanted her to catch her, because Qin Xiang is smart and Qin Xiang knew about Xin Yue’s plans. Xin Yue tells her that whatever Qin Xiang plans, she better not harm her dance house. The Eldest Princess hears about Hua Yue Nong, and while her husaband, the General tells her to don’t mind it, it’s just stories commoners tell to make life a little easier. She doesn’t want a story regarding the royal family, especially about her life to be rumors. The Princess asks Wei Wu Ji about the play and he assures her that there’s nothing malicious in it, it’s all romance and it’s earning her praise. There’s only one thing.. She asks what and he replies that the lead dancer could not capture the Princess’s beauty and temperament in the song. Xin Yue hears that the Princess’s son Wan Ang is here to watch the play. Wang An is a proud and obnoxious youth. Hong Gu says that they’re happy at his sudden appearance, and he sneers that are they saying he came to late and they have no room for him. Xin Yu snarks back that yes, he’s right, they don’t have room. His eyes widen in anger and she says respectfully, but of course they have room. Wan Ang is captivated by Ding Ling the dancer (who’s in love Eldest Bro Qin). Of course Second Brother Qin gives Wan Ang a note that he says is from Ding Ling that says that she wants to meet him. Xin Yue sees Qin Xiang standing to the side, Qin Xiang remarks that this was the best place to watch the play and the things happening in the house, she’s merely pointing out this prime place for Xin Yue. Later, Wang Ang takes the note and tries to drag Ding Ling out of the house (She had been drinking tea with Elder Brother Qin), saying that she’s teasing him by sending him a note and now refusing to go with. Xin Yue stops him and asks about the note, which 2nd Brother Qin lies and says that Ding Ling had given her. Xin Yu tells Wang An, “How about a wager – if you win you can take all the girls of this dance house home with you. and if you lose you never bother any girl here again.” The man hesistates and Xin Yue asks if he’s afraid? Wan Ang sneers and they’re agreed. Both of them will try to take a silver pin and whoever can pin it in Ding Ling’s hair first is the winner. Even though Wan Ang is a sneaky cheat and uses his men to keep Xin Yue from winning, she throws his men at him and grabs the silver pin, pinning it Ding Ling’s hair and winning. He grabs his sword and holds it to Xin Yue’s neck saying he’s going to kill her. Wan Ang is pissed but after Qin Xiang’s words about him being a big man that Xin Yue viewed seriously enough to challenge, he calms down. Xin Yue also placates him and he walks out happily. Elder Brother Qin is notably pissed about the whole situation. And he knows that Ding Ling didn’t write that note. He asks 2nd Brother for the truth. Turns out that it was Qin Xiang’s plan. She was testing Xin Yue, to see how she would do in a crisis. Elder brother tells her not to play with people. Qin Xiang replies that Xin Yue is more than capable of turning a bad situation into good, and that she was able to take care of everything. Unbeknownst to them, Xin Yue had heard it all outside. Back at the Shi House, Jiu Ye hears about XIn Yue’s treatement of Wan Ang and he’s not surprised. He smiles and says that he’s seen her do more amazing things, especially because it takes someone special to live among wolves. He silently worries over Xin Yue, she had traded in her wildest ways for city street smarts and sacrificed her freedom. The servant replies that he knows Jiu Ye’s harsh predicament, he had to cut off ties with the Dance House, but he still worries about Xin Yue. The servant promises to look in on Xin Yue for Jiu Ye. They tussle and Xin Yue nearly grabs his clothes off of him. He smirks and remarks, “With your daring, it’s no wonder why Wang Ang lost to you.” She huffs away angrily, all sopping wet. No one at the Dance house would offer him male clothes, even Hong Gu had to hesitantly offer him female skirts. So Wei Wu Ji goes to his horse sopping wet. Xin Yue watches him while laughing – “The people of Jian An try to look their best, but look at you.” Wei Wu Ji says haughtily that this will soon become the new fashion but as soon as he gets onto the horse with a squelch, water pours out of his clothes and it looks like he just pissed himself. Xin Yue cackles delightedly. That night Xin Yue goes to Shi House, she tries to sneak in with her face covered. She is attacked by the guards and had to reveal herself to the old housekeeper. She tries to deny that she wanted to secretly check up on Jiu Ye, so she lies that she’s really here because she missed the housekeeper. The old man smiles at her and says that she should go see Jiu Ye, that as the housekeeper, he’s been up too late and doesn’t have the strength to talk to her. Xin Yue happily goes to see Jiu Ye. She traces his face in on the window, looking at his eyes, his nose, his mouth. She silently asks his shadow, to tell her why Jiu Ye keeps secrets and if the shadow can reveal everything to her. At that moment, Jiu Ye opens the window, her hand inches from his face. She walks in and notices that he has a lamp and a candle lit, asks why. He says that one saying goes that when those two are lit, luck will fly to the room. She smiles and asks if he’s had good luck the. He smiles and says that the other saying is that if the candle light turns green, ghosts are near. He thought the light had turned green, that’s why he opened the window. She teases back, ghosts are attracted to good looking young men and try to eat their Yang energy, he should be careful. He asks that if she’s not busy, she should stay. The room she uses has always been kept ready. She asks if she can really stay and he says that the room would go unused if she doesn’t, she should stay. It’s just that she’s been so busy recently. Xin Yue asks why he’s giving up Jian An’s dance houses. Would he mind if she buys the dance houses? He tells her that once she pays off the current dance house, their partnership is over. She scrunches up her nose at the notion of him trying to push her away and promises that the harder he tries to push away, the harder she’s gonna stick around. She puts her hand out and tells him that she wants to borrow money from him. He gently pushes her hand down and tells her to take care of one house first, what’s wrong with quietly living her life? He assures her that the competitors wont touch her. She smiles and says, it’s clear that he’s still helping her. She tells him that shes doesn’t want to be a vine that the wall protects. She doesn’t want to rely on him to protect him from the rain and storms. She wants to be a wall too, be by his side. He sighs and tells her that he had been forced into this business, and that everything he does he has his reasons. He tells her to go rest. Xin Yue walks around her room, thinking that if the person she likes is unahppy then she too is unhappy. She wonders how she can be someone that Jiu Ye relies on. Wan Ang goes to tattle to the Princess and the General. The princess is unhappy but the General says young men fight, it’s not a big deal. She sighs about Wu Ji becoming wilder and the General defends his nephew by saying that under the right situation, Wu Ji could be brilliant. The Princess is more than curious about Xin Yue, anyone who could put Wu Ji in such a state and put on Hua Yue Nong, is someone not to be ignored, it’s time to finally meet this landlady of the dance house. When the princess comes, Xin Yue is grilling Qin Xiang about what she actually wants. Hong Gu rushes in hurriedly and pulled Xin Yue away, yelling that the princess is coming and this is no time for them to be just standing there! They rush to change Xin Yue’s hair and clothes and while Xin Yue struggles a little, Hong Gu holds her down. She saids that they need to be calm, Xin Yue observes that it’s Hong Gu who needs to calm down and Hong Gu mutters to herself to calm down. 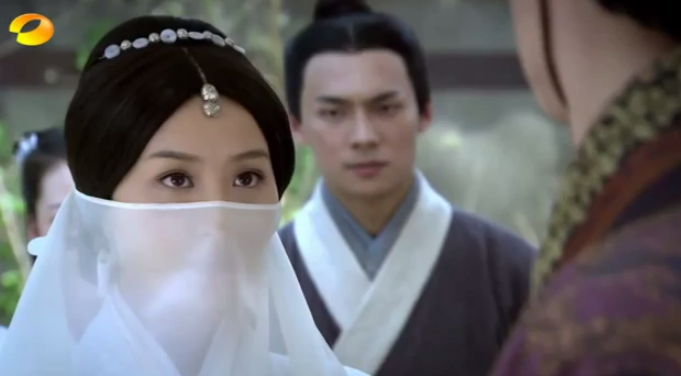 They greet the Princess and Xin Yue realizes that Hong Gu is right, she does need to be pretty for the occasion. They go in and put on a part of the play for The princess. Meanwhile Jiu Ye is outside having heard the news about the princess and knows that there is nothing he can do but wait and watch. The princess watches and is reminded of her story with her husband. (there’s poem about painful, heartbreaking love that is destined to be). She also notices the beautiful music. Wan Ang sees that Wei Wu Ji is helping the General and goads Wu Ji about the news, Wu Ji learns that The princess has gone to see Xin Yue. During the performance, Xin Yue realizes something is amiss and goes to look for Qin Xiang. She realizes that the girl is up to something. Once the play ends she realizes that Qin Xiang wants to use this opportunity to meet the Princess. Xin Yue grabs her before she reveals herself and tells her to think carefully, if she messes up then there won’t be another opportunity. Qin Xiang listens to Xin Yue and doesn’t meet the princess. At the end of the music, the princess asks who had came up with Hua Yue Nong. It was a good play but it can not be shown anymore. She says that she will bestow a gift to Xin Yue. The gift of death. Okay, this is veering somewhat from Tong Hua’s story. First of all, the princess in the story didn’t have children and now she does. One of them is stereotypically spoiled and she favors him. Also Qin Xiang in the novel was a subtle tactician whom shares a strong bond with Xin Yue but these two episodes kept telling us that theses two are like wary enemies without any good feelings between them. We get it, she’s semi-evil at this point. 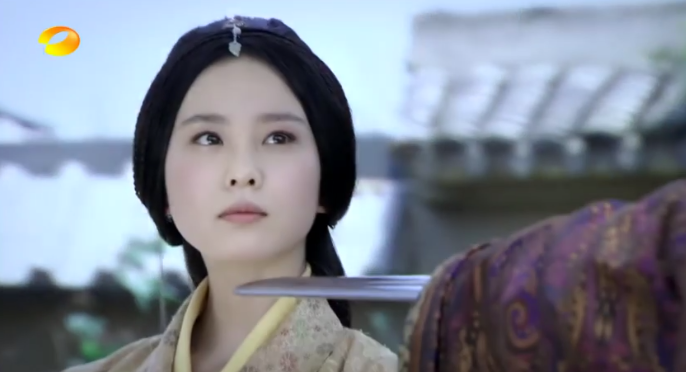 I’ve always liked the Qin Xiang (Li Yan) of the story, but I’m annoyed by her antics in the drama. The pond scene made me like Wei Wu Ji, he’s pretty rascally and yet I don’t see the strong warrior with the soft side for Xin Yue as described in the book. Eddie’s doing a good job and his smirk is boyishly adorable so I just need to give him more of a chance to get close to Xin Yue. But its definitely off to a good start. I’m quite annoyed with Qin Xiang myself, I’m not sure whether it’s Fala Chen’s acting or the script writers fault for making Xin Yue and Qin Xiang seem like enemy’s from the start before entering the Palace. It might be both! Also, Fala Chen doesn’t have that willowy grace that Li Yan is suppose to have, but again I’ll reserve that judgement for now. I completely agree with you, it’s a subtle transition but clearly the writers missed the memo. ill be in that line too! I’m off to sleep, have a great Friday! Hello, does anyone have any links for episode 3-4 in english? Are you watching the uncut version? Does anyone know what song was Jiu Ye playing when Xin Yue went to find him?